President Barack Obama basically annihilated Mitt Romney in a new poll in the key swing state of Ohio. Too bad for Obama that the vote only involved players of the online game Maple Story. It’s not going to be that easy, Obama. Nexon, the creators of Maple Story ran the third of three polls of their players to see whether they preferred Mitt Romney or Obama. The President earned the vote of 6,512 players in the U.S., according to a press release from Nexon PR. Romney got 1,873 votes. That enabled Obama to win this one 78%-22%. Most real national polls have the race just about tied, and much of the coverage of the election has centered on Ohio’s presumably pivotal roll in tilting the Electoral College toward Romney or Obama. 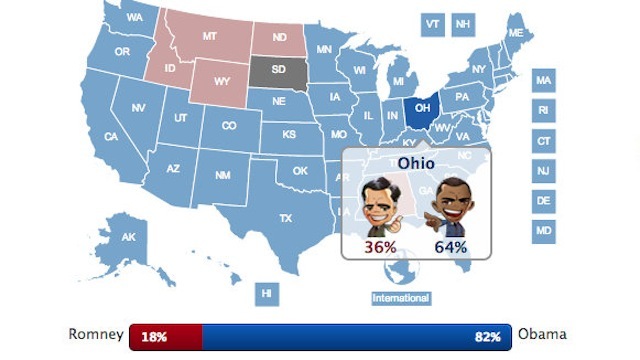 Most Ohio polls show Obama up as a slight favorite but not by the crazy margin in the Maple Story count. Romney fared so miserably in the game that he only won Alabama, Idaho, Montana, North Dakota, and Wyoming. He tied in South Dakota. A modern Republican Presidential candidate not even winning in Texas or Alaska? Madness. Clearly there’s a liberal bias here, but all Nexon is saying in terms of demographics is that “a large number of MapleStory players are between the ages of 18-29 with more than 40 percent being female.” Yep. And a very large number of them like Barack Obama. Click through the poll results yourself. If you’re a Romney person, you’re not going to like it. The map is pretty much all blue.